Any system or network administrator will know the importance of applying patches to the various software running on their servers be it the numerous bug fixes or upgrades. Now when you are maintaining just a single machine, this is really a simple affair of downloading the patches and applying them on your machine. But what happens when you are managing multiple servers and hundreds of client machines? How do you keep all these machines under your control up to date with the latest bug fixes? Obviously, it is a waste of time and bandwidth to individually download all the patches and security fixes for each machine. This is where this book named "Linux Patch Management - Keeping Linux systems up to date" authored by Michael Jang gains significance. 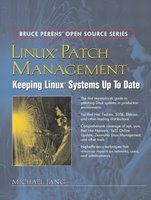 This book released under the Bruce Perens' open source series aims to address the topic of patch management in detail. The book is divided into seven detailed chapters, each covering a specific topic related to patch management. In the first chapter, the author starts the narration by giving an introduction to the basic patch concepts, the various distribution specific tools available for the user including Red Hat up2date agent, SUSE YaST online update, Debian apt-get and also community based sources like those in Fedora. What I found interesting was instead of just listing the various avenues that the user has regarding patching his system, the author goes the extra mile to stress the need for maintaining a local patch management server and also the need to support multiple repositories on it. The second chapter deals exclusively with patch management on Red Hat and Fedora based Linux machines. Here the author walks the readers through creating a local Fedora repository. Maintaining a repository locally is not about just downloading all the packages to a directory on your local machine and hosting that directory on the network. You have to deal with a lot of issues here, like the hardware requirements, the kind of partition arrangement to make, what space to allocate to each partition, whether you need a proxy server and more. In this chapter, the author throws light on all these aspects in the process of creating the repositories. I really liked the section where the author describes in detail the steps needed to configure a Red Hat network proxy server. The third chapter of this book namely SUSE's Update Systems and rsync mirrors describes in detail how one can manage patches with YaST. What is up2date for Red Hat is YaST for SuSE. And around 34 pages have been exclusively allocated for explaining each and every aspect of updating SuSE Linux using various methods like YaST Online Update and using rsync to configure a YaST patch management mirror for your LAN. But the highlight of this chapter is the explanation of Novell's unique way of managing the life cycle of Linux systems which goes by the name ZENworks Linux Management (ZLM). Even though the author does not go into the details of ZLM, he gives a fair idea about this new topic including accomplishing such basic tasks as installing the ZLM server, configuring the web interface, adding clients ... so on and so forth. Ask any Debian user what he feels is the most important and useful feature of this OS, then in 90 percent of the cases, you will get the answer that it is Debian's contribution to a superior package management. The fourth chapter takes an in depth look into the working of apt. Usually a Debian user is exposed to just a few of the apt tools. In this chapter though, the author explains all the tools bundled with apt which makes this chapter a ready reference for any person managing Debian based system(s). If the fourth chapter concentrated on apt for Debian systems, the next chapter explores how the same apt package management utility could be used to maintain Red Hat based Linux distributions. One of the biggest complaints of users of Red Hat based Linux distributions a few years back was a lack of a robust package management tool in the same league as apt. To address this need, a group of developers created an alternative called YUM. The last two chapters of this book explores how one can use YUM to keep the system up to date as well as hosting ones own YUM repository on the LAN. Michael Jang has specialized in networks and operating systems. He has written books on four Linux certifications and one of them on RHCE is very popular among students attempting to get Red Hat certified. He also holds a number of certifications such as RHCE, SAIR Linux Certified Professional, CompTIA Linux+ Professional and MCP. Each chapter of the book explores a particular tool to achieve patch management in Linux and the author gives in depth explanation of the usage of the tool. All Linux users irrespective of which Linux distribution they use will find this book very useful to host their own local repositories because the author covers all distribution specific tools barring Gentoo in this book. The book is peppered with lots of examples and walk throughs which makes this an all in one reference on the subject of Linux patch management. I especially liked the chapter on apt package management which explored many useful commands which are seldom used or known by the greater percentage of people. Update: This review has been carried on slashdot.org. You can read the comments there.